"The Tarot is a pack of 78 playing cards used both for divination (predicting the future) as well as a kind of guided meditation. It is a collection of symbols or archetypes that represent all of human experience. The Tarot is a map of spirit, heart and soul. You lay it out so you can get a bird's-eye-view." Found: A playing card and a cracked mirror. Clubs in an ordinary deck of playing cards are equivalent to Wands in a Tarot deck of cards. "Here a hunched-over figure is carrying ten wands. They are so heavy and unwieldy that they block his view of where he's going. The man is carrying more that he should. By burdening himself will all the wands at once, he is hindering his own progress. You get the sense that if he put down some of the wands and took multiple trips, it might take longer, but he would be more successful. Or if he carried the wands in a different arrangement, he could see where he was going. As it is, though, the burden has become overwhelming. If one is going to carry on, adjustments will have to be made. 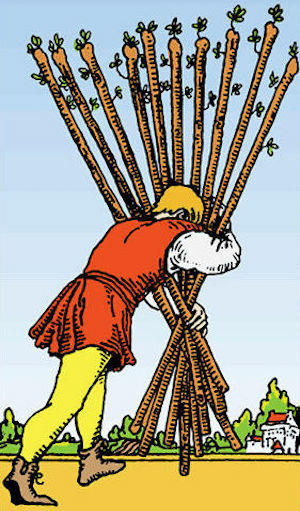 Burnout is a very fitting word for the Ten of Wands. The wands represent fire, everything that excites us and gives us pleasure. But too much excitement can lead to exhaustion, and too much fire can lead to burnout." 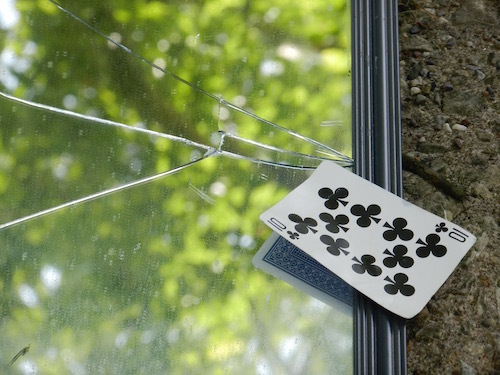 Just as I came upon this cracked mirror with the Ten of Clubs, a large black bird dropped from a tree. Thud! Dazed and immobile except for his eyes that seemed to spin in circles. What bird falls from a tree for no reason? Perhaps he was tired. Maybe 'burned out' from too much flying, mating, nesting, or hunting for berries... or whatever else birds do. Fortunately, the bird recovered. He was gone by the time I returned from my walk. 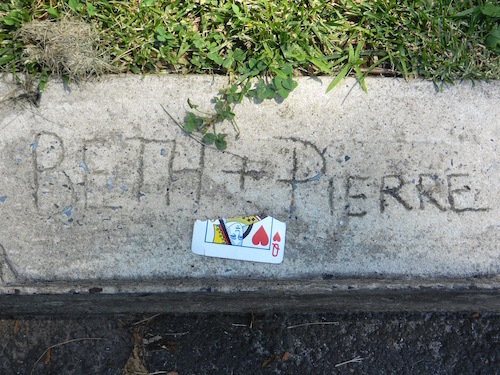 Found: A partial playing card and names carved in concrete. Hearts in an ordinary deck of playing cards are equivalent to Cups in a Tarot deck of cards. This card symbolizes calm, compassion, intuitiveness and represents emotional security. 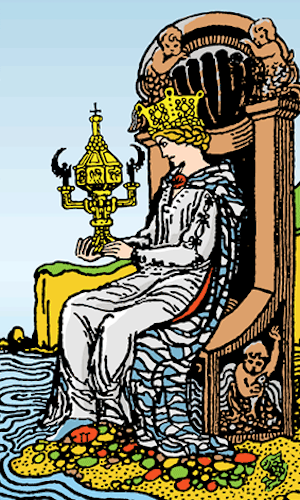 The Queen of Cups is the 'Queen of emotions'. Here she sits in deep contemplation by the edge of the sea on a throne adorned with fish, shells, and sea nymphs while holding an ornate sealed cup with angel-shaped handles symbolizing thoughts from the deep recesses of the Queen's unconscious. This card signifies a good outlook in love and relationships. It indicates a nice balance: equal love shared, with trust and respect between both parties. I first noticed the couple's name inscribed in freshly poured concrete around the time their house went up for sale, about two years ago. Now with the addition of the torn and reversed Queen of Hearts/Cups, one has to wonder if Beth & Pierre are still together. Let's hope for their good fortune and yours! How strange to encounter playing cards on these objects! By the condition of the cards, it looks like they haven't been there very long. I wonder if the same person put them there? It's always a mystery as to what I'll find when I walk down this street on a Monday... 'trash day'. Things left behind or deliberately placed? Here, I'd say the items were left behind. Two more "Walked & Found" posts soon to be published. One object was definitely placed... but not by me.